Krooner took his Championship on November 10, 1997 !! Krooner's a lover, purrsonality plus, he follows me everywhere with constant purrs. 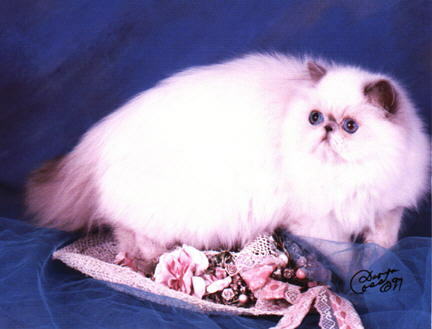 He is a very beautiful show quality blue point male, with large, round, deep blue eyes. He has good coat and boning. Krooner is now one year old. Photos taken at 4 months of age. UPDATE: Krooner is now Co-owned with Michelle Gillan of Krystalwood Cattery, who will soon obtain full ownership. He is the father of two litters on the way. The first, out of Katsations Cleopatra is due in early February, and the second, out of Katsations Kassiopeae is due in mid March. He is a very sweet boy and we love him very much. We also have a new addition to our family. 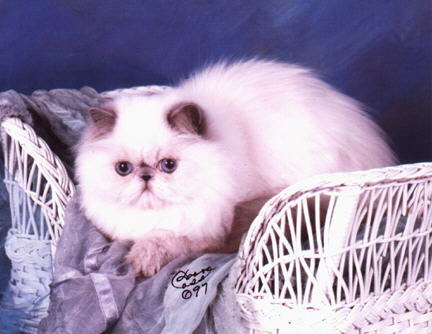 A blue-point female named Katsations Kindred Spirit. UPDATE: Michelle and Jon agreed to let Krooner go, he is now happily residing in the Ukraine with Aljona & Vladimir Bukalov, More information to come!